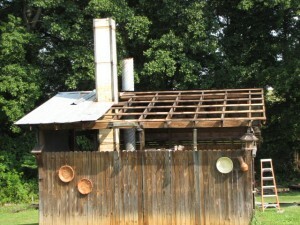 I'm firing up the ole salt kiln in a few weeks! It will be the first time in 2 years since it's been fired and I'm pretty excited to see some pots come out of it. I'm firing along with 5 friends so I won't be making a lot of pots to fill it. The tin roof has been rusted out for a while now and after one of those last hailstorms we had it ended up with some pretty big holes in it. The tin directly over the kiln is effected the most due to the salt vapor that rusts any metal in the vicinity. I took six sheets off yesterday and I think I'll probably go ahead and replace those last few while I'm up there. I did some inventory on my tin stack too. I didn't realize I had quite so much. A good portion are short pieces but in good shape and I can use them. Some has some surface rust from being stacked up and in the weather, but all in all it's in good shape and I don't have to purchase any materials. 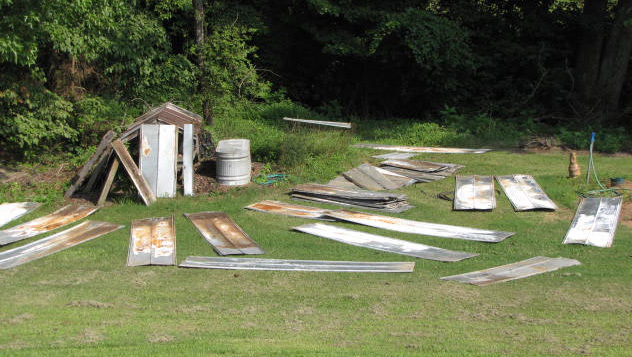 The temps are supposed to be in the low to mid 90's today so I'll wait till later in the day when the shed is in the shade of the trees before getting up there to start nailing on. I just listed some New Mugs and Cups in the Online Shop!! Click HERE.